Alisha Garcia is a Licensed Professional Counselor and a National Certified Counselor at The Anxiety & Stress Management Institute. 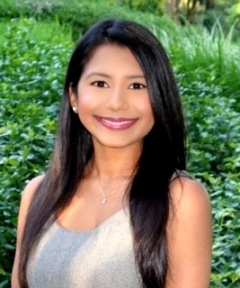 She has a Master’s degree in Clinical Mental Health Counseling from Georgia State University as well as a Bachelor of Science degree in Psychology from Georgia Institute of Technology. Alisha’s passion is working with adults and teenagers struggling with anxiety, stress, depression, relationship issues, job difficulties, decision-making difficulties, life transitions, cultural issues, and family issues. Alisha strives to always provide the best treatment for her clients by finding continuing education opportunities throughout her career to utilize the most effective, research-based treatment modalities for her clients’ presenting issues. Her therapeutic approach is based on using Cognitive Behavioral Therapy (CBT) techniques to teach her clients to identify and learn how thoughts, feelings, and beliefs influence our behaviors. When working with anxiety disorders, Alisha uses a combination of CBT and Exposure and Response Prevention (ERP), and mindfulness meditation/relaxation practices to teach her clients how to manage their anxiety. Alisha’s primary goal is to make her counseling sessions as comfortable as possible for her clients by always striving to understand her client’s perspectives and encouraging them to open up in a safe and welcoming environment. Alisha works collaboratively with her clients to address their concerns and distress through a nonjudgmental, empathetic, and open approach. Her goal is to help her clients learn effective ways to manage anxiety, reduce negative, irrational or obsession-based thinking, increase self-confidence, and find resilience through challenging, emotional life situations. Alisha believes that past life experiences often lead to learned patterns in present behavior and relationships. When these learned behaviors are negative or self-defeating, making change is difficult but Alisha’s goal is to teach her clients how to identify and challenge unhelpful thoughts, feelings and behaviors, and learn to use their strengths to achieve positive and lasting change. Alisha’s areas of expertise include generalized anxiety, social anxiety, panic disorder, OCD, depression, relationship concerns, family issues, cultural issues, career counseling, and eating disorders. She works with adults and adolescents. Alisha has previously led the Free Anxiety and Stress Management Support Group and co-led the African-American Women’s Group at The Anxiety and Stress Management Institute. She has also given professional corporate presentations and done community education and outreach in school/college-based settings on anxiety and stress management. Alisha also has extensive experience working with individuals with cognitive impairment from her time at SimpleC, a healthcare company where she has worked with older adults with dementia, family members experiencing caregiver stress, veterans with PTSD, and individuals with developmental disabilities. She has also worked on research projects that are focused on memory rehabilitation and reducing anxiety.